Meta-analysis is a popular methodology in several fields of medical research, including genetic association studies. However, the methods used for meta-analysis of association studies that report haplotypes have not been studied in detail. In this work, methods for performing meta-analysis of haplotype association studies are summarized, compared and presented in a unified framework along with an empirical evaluation of the literature. We present multivariate methods that use summary-based data as well as methods that use binary and count data in a generalized linear mixed model framework (logistic regression, multinomial regression and Poisson regression). The methods presented here avoid the inflation of the type I error rate that could be the result of the traditional approach of comparing a haplotype against the remaining ones, whereas, they can be fitted using standard software. Moreover, formal global tests are presented for assessing the statistical significance of the overall association. Although the methods presented here assume that the haplotypes are directly observed, they can be easily extended to allow for such an uncertainty by weighting the haplotypes by their probability. An empirical evaluation of the published literature and a comparison against the meta-analyses that use single nucleotide polymorphisms, suggests that the studies reporting meta-analysis of haplotypes contain approximately half of the included studies and produce significant results twice more often. We show that this excess of statistically significant results, stems from the sub-optimal method of analysis used and, in approximately half of the cases, the statistical significance is refuted if the data are properly re-analyzed. Illustrative examples of code are given in Stata and it is anticipated that the methods developed in this work will be widely applied in the meta-analysis of haplotype association studies. The continuously increasing number of published gene-disease association studies made imperative the need of collecting and synthesizing the available data [1, 2]. The statistical procedure with which data from multiple studies are synthesized is known as meta-analysis [3–5]. In meta-analysis, a set of original studies is synthesized and the potential heterogeneity is explored using formal statistical methods [3, 4, 6, 7]. In the medical literature, meta-analysis was initially applied in the field of randomized clinical trials [8, 9], but nowadays it is considered a valuable tool for the combination of observational studies , as well as for genetic association studies for which specialized methodology has been developed [5, 11–18]. Most of the genetic association studies (and hence the meta-analyses derived from them) are performed using single markers, usually Single Nucleotide Polymorphisms (SNPs). However, the SNP that is under investigation is not always the true susceptibility allele. Instead, it may be a polymorphism which is in Linkage Disequilibrium (LD) with the unknown disease-causing locus . In such cases, the single marker tests may be underpowered, depending on the degree of LD and the allele frequencies . Haplotypes, which are the combination of closely linked alleles on a chromosome, are therefore important in the study of the genetic basis of diseases and thus, they are extensively used [21, 22]. The importance of studying haplotypes ranges from elucidating the exact biological role played by neighbouring amino-acids on the protein structure, to providing information about ancient ancestral chromosome segments that harbour alleles influencing human traits . Moreover, haplotype association methods are considered to be more powerful compared to single marker analyses [24, 25], even though this is questioned by some researchers . A major problem in haplotype analyses is that in order for the analysis to be performed we need to reconstruct or infer the haplotypes, usually with an approach based on missing data imputation [27–29]. This uncertainty in imputing the haplotypes poses some problems in the analysis  that are to be discussed later in this work. Nevertheless, studies that investigate the association of haplotypes with diseases are increasingly being published (Figure 1), with an even more increasing rate after 2003, when the HapMap project was initiated . This exponential increase follows the general pattern of gene-disease association studies [1, 2, 32] and naturally, the obvious extension would be to use meta-analysis in order to increase the power of individual studies and to resolve the reasons of heterogeneity and inconsistency. A graphical representation of the increasing number of published haplotype-association studies. A search was performed in Pubmed using the terms "haplotype" and "association" from 1997 to 2009. 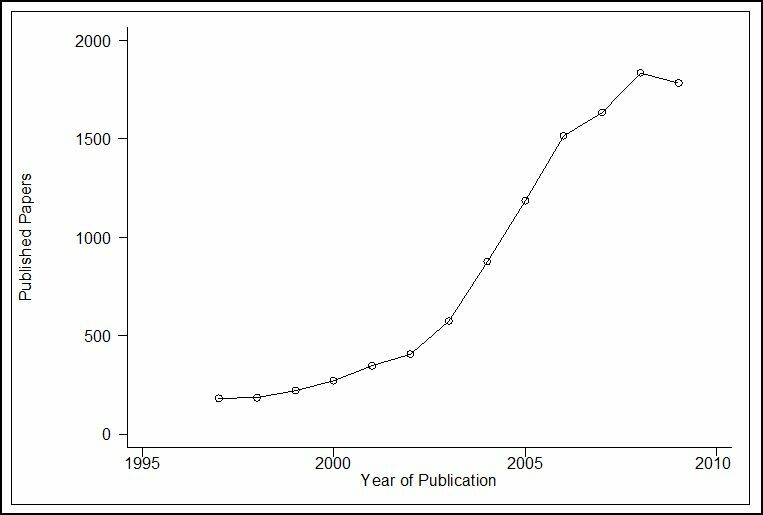 Even though the reference list may include review articles, methodological papers or even irrelevant works, the trend is obvious, especially after 2003 when the HapMap project was presented. The search was conducted during December 2009 and thus the count for 2009 may be an underestimate. This work has two primary goals. First, to perform a detailed literature search and an empirical evaluation of the published studies that report meta-analyses of haplotype associations; and second, to present a concise overview of the statistical methods that could and should be used in such meta-analyses. These two important issues were not previously studied in the literature and the findings are interesting. Even though the methods presented in this work could be derived in a straightforward manner from extending previous works on multivariate meta-analysis [33–37], the majority of the published meta-analyses did not use optimal methods for analyzing the data. Moreover, in several circumstances the results of some studies are shown to be severely flawed. The manuscript is organized as follows: Initially, the commonly used methods for haplotype analysis for a single study are reviewed in order to establish notation. Afterwards, the methods of meta-analysis are presented. In particular, we present the standard method of univariate meta-analysis and its limitations, which leads to a more powerful multivariate approach based on summary-data. Accordingly, a general framework based on generalized linear mixed models (GLMMs) is presented and the approaches based on logistic regression, multinomial logistic regression and Poisson regression are discussed. We also discuss continuous traits and details of the implementation of the models. Finally, we present the results of the empirical evaluation of the literature and compare the results reported in these analyses with the ones obtained using the methods developed here. The haplotype data obtained in a case-control study on 182 caucasian women concerning the association of p53 haplotypes with breast cancer . The data are presented in the form described by Wallenstein and coworkers . This model was proposed initially by Wallenstein and co-workers and as we already mentioned, assumes a multiplicative genetic model of inheritance . Moreover, the haplotypes are assumed known quantities, which may not always be the case (see below). it is easy to understand that the β j coefficients obtained by fitting the model are estimates of the log-Odds Ratios (i.e. for comparing h j vs. h1) in equivalence to the respective coefficients of the model in Eq. (1). Obviously, β1 = 0 for identifiability since haplotype j = 1 (i.e. h1) is used as the reference category. The particular model was first used for haplotype analysis by Chen and Kao . This is the standard saturated model for describing the 2 × r contingency table of haplotypes by disease. The β j 's are the coefficients that correspond to the haplotype by disease interaction and are equivalent to those obtained by fitting the models in Eq. (1) and (2). It is easily verified that the coefficients α's and β's are identical across the three models. The overall hypothesis for association (β = 0) can be tested by performing a multivariate Wald test using the estimated covariance matrix, cov(β). Then, the test statistic (score) U = β' cov(β)-1β, will have asymptotically a χ2 distribution on r-1 degrees of freedom. Alternatively, a likelihood ratio test comparing the saturated model against the model with no interaction can be performed. Similar tests can be performed for the models in Eq. (1) and (2). Whatever the assumed sampling scheme that gave rise to the data of Table 1 may be, it is well known that the results of fitting each one of the three models are nearly identical . For instance, it has been shown that maximum likelihood estimates obtained from the "retrospective" likelihood are the same as those obtained from the "prospective" likelihood [46, 47]. The equivalence of logistic regression and Poisson modelling has been also exploited in the past for deriving methods for detecting gene-environment interactions . The methods discussed above are simple applications of the generalized linear model extending the analysis of single markers to haplotypes and assume that, i) the haplotype risk follows a multiplicative model of inheritance, ii), the haplotype phase is known and, iii) the population is in Hardy-Weinberg Equilibrium (HWE). The genetic model of inheritance can be handled simply by using in the analysis the so-called haplo-genotypes or diplotypes, instead of the genotypes. This is easily performed with all the previously presented methods by using the pairwise combinations of haplotypes (h1h1, h1h2 and so on). In case-control association studies, however, with the exception of some cases where direct genotyping of the haplotypes is applicable (i.e. ), the haplotypes (and the haplo-genotypes) are usually not known, but are inferred from the data using statistical methods for missing data, usually with an EM or EM-like algorithm [27–29]. Thus, treating them as known quantities has been shown to be problematic . More advanced methods have been developed in order to account for these limitations, for instance weighting the haplotypes by their probability [49, 50]. Score methods based on the prospective likelihood  or the retrospective likelihood , have also been developed, as well as methods for allowing for gene-environment interaction . A comparison of methods has shown that the approaches are roughly comparable when the haplotype effect on disease odds follows a multiplicative model. However, for dominant and recessive models, the retrospective-likelihood method has increased efficiency with respect to the prospective methods . Graphical models have been proposed by Thomas  and log-linear models by Baker . Lin and co-workers extended the previously presented methods by including various sampling schemes in a unified framework . Even though a large body of the genetic epidemiology literature is dedicated to such methods, their application in meta-analysis is problematic since in most cases the original data are not available to the analyst. Thus, in the following sections where the methods for meta-analysis are summarized we also assume that the haplotypes are known. An extension when the posterior probabilities of haplotypes are given from the output of the haplotype inference software would then be straightforward. In this section the methods for meta-analysis are presented. Initially we will discuss simple methods using summary data, whereas in the next sub-section more advanced methods that use generalized linear models on grouped or Individual Patients Data (IPD) are presented. The between-studies variance (τ2), could be easily computed by the non-iterative method of moments proposed by Dersimonian and Laird , even though there are several alternatives that use iterative procedures (i.e. Maximum Likelihood (ML) or Restricted Maximum Likelihood (REML) ). Apparently, by setting τ2 = 0 in Eq. (9) corresponds to the well known fixed-effects estimator with inverse variance weights. The particular approach is very easily implemented, intuitive and it can be performed in a standard univariate meta-analysis framework. In the results section we will see that several already published meta-analyses used this method. However, the method has some drawbacks. The most important is that it is prone to an increased type I error rate due to multiple comparisons. Multiple comparisons constitute an important problem in haplotype analysis, especially as the number of haplotypes increases [59, 60]. The model implied by Eqs. (5) - (8), is conceptually similar to collapsing the genotypes in a single-marker analysis, an approach that has been shown to increase the power as well the type I error rate . Thus, the particular approach can be justified, only when there is strong prior knowledge concerning a particular haplotype and this haplotype is the only one that is being tested. We should mention that from standard normal theory it is known that the multivariate test for β = 0, based on β' cov(β)-1β, could yield significant results even if all the r-1 univariate Wald tests are non-significant. Thus, the multivariate test should be performed initially and only if a significant result is found we can proceed by collapsing the haplotypes and perform a standard univariate meta-analysis. The model can be fitted in any statistical package capable of fitting random-effects weighted regression models with an arbitrary covariance matrix, such as SAS (using PROC MIXED or PROC NLMIXED), R (using lme) or Stata (using mvmeta). In this work, we used mvmeta which performs inferences based on either Maximum Likelihood (ML) or Restricted Maximum Likelihood (REML), by direct maximization of the approximate likelihood using a Newton-Raphson algorithm . Alternatively, mvmeta can also implement the multivariate version of the DerSimonian and Laird's method of moments . The last option, being non-iterative, is very attractive in case of large number of haplotypes and/or large number of studies. A major disadvantage of the methods proposed in this section is the assumptions of normality that are employed and the need for correction when there are rare haplotypes (i.e. adding a pseudocount of 0.5 to the haplotypes with zero counts). These limitations are surpassed by using the methods discussed in the next section. In this section, methods that use directly the binary nature of the data, within a generalized linear mixed model (GLMM) are presented. These methods are usually termed IPD methods [33–37] although in many real-life applications, individual data may not be literally available. Instead, extending the models described for a single study, only summary counts of individuals carrying the respective haplotypes will normally be used. This measure is quite useful, since it enables us to summarize the overall heterogeneity, instead of having to look at multiple indices of heterogeneity arising from multiple haplotype contrasts. The between studies variances and covariances have the same interpretation as the ones obtained by the summary-data methods of Eq. (13) and (15). The statistics for heterogeneity (W) as well as the I2 index derived from it are identical to the one presented in Eq. (19) - (21). and the model is completely specified as a random effects multivariate meta-analysis, with random terms β i distributed similarly as β i ~MVN(0,Σ). The interpretation of the variances and covariances of the random terms is identical to the ones presented in Eq. (13). A version of this model has been used previously for meta-analysis of genetic association studies involving single nucleotide polymorphisms , but according to the author's knowledge it has never been used for meta-analysis of haplotypes. The test with the null hypothesis Η0: γ = 0 (γ ij = 0,i = 2,3,...,k, j = 2,3,...,r) is identical to the ones obtained by fitting the models in Eq. (18) and (27). The three-way interaction model and its interpretation in terms of testing the homogeneity of ORs has been discussed in detail in the past [45, 74–76]. Log-linear models have been employed in several meta-analyses of haplotype association [77, 78] (see in the results section). However, even though not described in detail, it is apparent from the results reported, that in these analyses the log-linear model was not applied in an appropriate manner. Although the authors stated that they performed stratification by study, they probably included only the main effect of the study and not the interaction terms with both haplotypes and disease. As we will see in the results section, when the correct model is applied, the originally drawn conclusions are compromised. with random terms β i distributed similarly as β i ~MVN(0,Σ). Similarly to the multinomial logistic regression model, the interpretation of the variances and covariances of the random terms is identical to the ones presented in Eq. (12). with random terms β i distributed similarly as β i ~MVN(0,Σ). Similarly to the previously described models, the interpretation of the variances and covariances of the random terms is identical to the ones presented in Eq. (12). In case where individual data are not available, the above models could be easily fitted using summary data (mean values and standard deviations) per haplotype. The models presented in this section can be easily fitted in Stata using gllamm, or in SAS using PROC NLMIXED. These models are expected to perform better compared to the models presented in the previous section, in case the normality assumption for logORs does not hold. Furthermore, a major advantage of these models is that they can directly be used for pooled meta-analyses performed under large collaborative projects. This is why these models are usually termed Individual Patients Data (IPD) methods . However, a disadvantage is that these methods are computational intensive, especially when the number of haplotypes is large. The particular approximation is conceptually similar to the one used previously for the so-called "genetic model-free approach" for meta-analysis of genetic association studies [14, 80], even though the motivation was different. The model imposes a single between studies variance τ2 thus, it is much faster since the factor loadings λ j with j = 3,4,...,r are treated as fixed-effects parameters. By observing also the off-diagonal elements of the covariance matrix in Eq. (37), we can see that the model restricts the between-studies correlations (ρ Bjj' ) to be equal to ±1 (depending on the sign of λ j λ j' ). Nevertheless, the between-studies correlations are usually poorly estimated especially when the number of studies is small (<20) and in such cases they are usually estimated to be equal to ±1 [81, 82]. Thus, the particular approach seems to be a good compromise between speed and precision and we expect to perform well. Using this approach, the computational complexity as well as the execution time is reduced drastically but the obtained estimates agree up to the fourth decimal place in most of the experiments conducted. A final comment has to be made concerning the identifiability of the models presented in the previous sections, especially when it comes to the log-linear models which are the ones that contain the largest number of parameters. Concerning the fixed effects methods, the number of parameters of the saturated model of Eq. (30) is equal to 2rk, a number that is equal to the number of observations . For the model of Eq. (29), the number of freely estimated parameters is equal to rk + r + k-1, which is obviously smaller than 2rk (since r > 1 and k > 1). The random effects model of Eq. (31) has a total number of parameters equal to rk + r + k-1 + r(r- 1)/2 since we need to estimate additionally r(r- 1)/2 elements of the covariance matrix (the variances and the covariances of the random effects). Thus, in order for the model to be identifiable we need to ensure that rk + r + k-1 + r(r- 1)/2 ≤ 2rk which is accomplished if k; ≥ 1+r/2. Intuitively, we need a relatively larger number of studies compared to the number of haplotypes. If on the other hand, we fit the model of Eq. (31) using Eq. (35) for restricting the covariances, we only need rk + r + k parameters and when we use Eq. (36) or Eq. (37), we need to estimate rk+2r + k-1 parameters, numbers which both are smaller than 2rk. Nevertheless, for practical applications, we will normally use the logistic regression model of Eq. (22) coupled with parameterization of Eq. (37), and thus identifiability issues will never arise in practice. In Additional file 1, Stata programs for fitting the models developed in this section are presented. The models were fitted using the gllamm module for Stata [83, 84]. gllamm uses numerical integration by adaptive quadrature in order to integrate out the latent variables and obtain the marginal log-likelihood. Afterwards, the log-likelihood is maximized by Newton-Raphson using numerical first and second derivatives. We initially performed a literature search for identifying studies that report meta-analyses of haplotype associations. The initial search in PUBMED using the term "haplotype" combined with "meta-analysis" or "collaborative analysis" or "pooled analysis" yielded 282 studies. Of these, 35 studies could have been identified using solely the terms "collaborative analysis" or "pooled analysis" and "haplotype". After careful screening, 207 studies were excluded as irrelevant ones (they were not meta-analyses of haplotypes), 36 studies were excluded for various reasons (family based-studies, meta-analyses of SNPs with the term "haplotype" appearing in the abstract or haplotype analyses in which the term "meta-analysis" appeared in the abstract etc). Finally, we came up with 39 published papers containing data for 43 associations. Some studies reported different sets of haplotypes from the same gene (Auburn et al, 2008; Zintzaras et al, 2009), haplotypes from different genes (Thakkinstian et al, 2008), or distinct outcomes measured on different subsets of patients (Kavvoura et al, 2007) and thus, they were included twice, whereas from studies that reported different outcomes measured on the same set of individuals we kept only one. There were also some pairs of studies that evaluated the same association and from these we kept only the largest one. 10 out of the 39 published papers could have been identified using solely the terms "collaborative analysis" or "pooled analysis" coupled with the term "haplotype". The 43 studies and their characteristics are presented in Table 2. We list the reference, the gene name, the disease, the number of SNPs included in the haplotypes, the number of studies, the total sample size, the method of analysis (N/A: not available), the availability of data, whether the data was collected in a collaborative setting and whether the study reported significant results. The average number of polymorphisms included in the haplotypes was 3.19 (SD = 1.37, median = 3, range from 2 to 7), whereas the sample size was 5,017.81 (SD = 4,703.24, median = 3,004, range from 348 to 23,309). The average number of included studies was 5.14 (SD = 3.06, median = 4, range from 2 to 13). Twenty seven studies (62.79%) were conducted in a collaborative setting, whereas sixteen (37.21%) were performed using data derived from the literature. Twenty seven of the meta-analyses (62.79%) reported significant results and the majority (22 studies, 51.16%) were analysed under the "1 vs. others" approach using standard summary based meta-analysis techniques (with fixed or random effects), 11 studies (25.58%) were analysed by pooling the data inappropriately, 6 studies (13.95%) did not report the method or did not perform pooling at all and 4 analyses (9.30%) were performed using a fixed effects logistic regression model. Only 13 studies (30.23%) reported the complete data that suffice for the analysis to be replicated (Table 2 and 3). There was only some weak evidence where collaborative meta-analyses contained larger number of studies compared to literature-based ones (5.67 vs. 4.25), larger sample size (5,651 vs. 3,948) and produced significant results more frequently (66.67% vs. 56.25%). However, these differences did noreach statistical significance (p-values equal to 0.144, 0.256 and 0.506 respectively). The average number of included polymorphisms was also comparable (3.26 vs. 3.06, p-value = 0.654). The thirteen meta-analyses that reported complete data, did not differ significantly from the remaining ones in terms of the included studies (4.46 vs. 5.43, p-value = 0.345), the number of SNPs in the haplotypes (3.08 vs. 3.23, p-value = 0.735) and the proportion of significant findings (69.23% vs. 60%, p-value = 0.576). The proportion of collaborative analyses was higher, even though this difference did not reach statistical significance (76.92% vs. 56.57%, p-value = 0.216). There was however, moderate evidence that the total sample size included in the meta-analyses that reported complete data was smaller compared to the meta-analyses that did not (3,040.31 vs. 5,874.73, p-value = 0.069). We also compared the particular database against a database of 55 representative meta-analyses of genetic association studies of SNPs that was used previously in several empirical evaluations [85–89]. The mean sample size was approximately equal (5,017 vs. 4,829, p-value = 0.844), but the number of included studies was nearly halved in the meta-analyses of haplotypes (5.14 vs. 10.53, p-value < 10-4), whereas the proportion of meta-analyses with significant results was twice as large (62.8% vs. 27.27%, p-value = 0.0003). The thirteen studies that reported the data necessary for the analysis to be replicated were subsequently used in order to apply the methods proposed in this work. We used all the methods described in the methods section except for the simpler approach of comparing 1 vs. the others haplotypes, i.e. Eq.(5). The results are reported in Table 3, where we list the p-values for the tests for the overall association (β = 0). For the fixed effects IPD methods we additionally report the p-value of the overall test for the heterogeneity (γ = 0). Concerning the results obtained using the IPD methods, we report only the ones obtained from the logistic regression method of Eq. (22) using the parameterization of Eq. (37) which is easier to be fitted, even though the multinomial logistic regression and the Poisson regression method would yield similar results. As expected, when the heterogeneity is low (in 8 out of the 13 studies), the random effects methods coincide with their fixed effects counterparts. In general, the methods that use summary data yield slightly different estimates for the ORs compared to the methods that use IPD, when there were rare haplotypes (i.e. small counts) or when the total number of subjects was low (data not shown). In 2 out of the 13 studies the estimates for the multivariate Wald tests for the overall association (β = 0) produce marginally different results compared to the univariate ones. For either fixed or random effects methods, we list the p-values for the tests for the overall association (β = 0) using the summary data based methods and the IPD methods. The results for the IPD methods were obtained from the logistic regression method even though the multinomial logistic regression and the Poisson regression method yield nearly identical results. For the fixed effects IPD methods we also list the p-value of overall test for the heterogeneity (γ = 0). (*): The significance of the multivariate Wald test (β = 0) contradicts univariate one (β j = 0). ($): The initially claimed statistically significant results are contradicted by either the multivariate or univariate Wald tests (random effects). ($$): The initially claimed statistically significant results are contradicted by both the multivariate and univariate Wald tests (random effects). The subsequent re-analysis and the contrasting with the initial reports yielded some important findings. Concerning the four studies that initially reported no significant association [90–93], the methods presented in this work largely support the initial conclusions. Three of the nine studies (33.33%) that reported statistically significant results [94, 95] yielded results that are in complete agreement with the initial reports (the meta-analysis of Kavvoura and co-workers reported results for two outcomes and it was counted twice). The most important finding, however, was the observation that 4 out of the 9 studies (44.44%) [78, 96–98], yielded results that contradict the initial reports. Two additional studies [68, 99] produced marginally significant results as judged by the disagreement between the multivariate and univariate Wald tests (Table 3). The reasons for these discrepancies deserve further investigation. For instance, in the collaborative meta-analysis for the association of CAPN10 haplotypes with Type 2 Diabetes mellitus , the authors report a marginally significant OR of 1.09 (1.00, 1.18) for the "1-2-1" haplotype and similar results for two haplogenotypes that include this haplotype. Similar results were previously reported in a literature-based meta-analysis . However, these estimates have been derived using the "1 vs. others" approach, which although more powerful, it is known to suffer from increase type I error rate; thus it seems that these estimates are the result of a multiple testing procedure. For the meta-analysis concerning the association of ITGAV haplotypes with Rheumatoid Arthritis , as well as the association of G30/G72 haplotypes with schizophrenia , the authors did not explicitly state how the pooling of estimates was performed, but the methods presented in this work suggest clearly that there is not enough evidence supporting the claimed associations. Finally, in the case of the meta-analysis for the association of VDR polymorphisms with osteoporosis, in which the authors claimed to use a log-linear model , the initially drawn conclusions are not supported. It seems that the authors did not use a correctly specified model that contains all the main effects as well as all the two-way interactions (i.e. the "no three-factor interaction model"). This probably resulted in performing a meta-analysis essentially without stratifying by study. Given that in the particular dataset the heterogeneity is large, it is of no surprise that the originally drawn conclusions are compromised after the re-analysis, which strongly indicates that there is no evidence to support a significant association. Concerning the two datasets for which we observed disagreement between the multivariate and univariate Wald tests, i.e. the association of CX3CR1 haplotypes with CAD  and the association of VEGF haplotypes with ALS , there were different reasons for the discrepancies. In the meta-analysis of CX3CR1 haplotypes (which was originally performed using the "1 vs. others" approach) the small discrepancies could be attributed to the marginal statistical significance (p-values = 0.06-0.09) and the existence of a rare haplotype. In the case of the VEGF meta-analysis, the authors initially used a fixed-effects logistic regression model analogous to Eq. (17); however, the moderate heterogeneity produced slight discrepancies in the results of the multivariate Wald test under the random effects model (Table 3). Although the studies reporting haplotypes comprise a small fraction of genetic association studies, their number is increasingly growing and so there is a need for developing formal methods for combining them in a meta-analysis. In this work, a comprehensive framework for the meta-analysis of haplotype association studies was presented and an empirical evaluation has been performed for the first time in the literature. The methods proposed in this work are extending previous works in meta-analysis of genetic association studies [12, 16] in order to handle the multiple haplotypes. These works in turn, are based on the previously described large corpus of methods for multivariate meta-analysis [33, 36, 37, 62, 101–103]. We proposed summary-data based methods as well as methods for IPD. Although the former are very easily implemented, the latter provide some very useful insights. By viewing the meta-analysis data as a 2 × r × k contingency table  allowed developing methods based on logistic regression, multinomial logistic regression and Poisson regression. Although logistic regression methods have long being used for meta-analysis of IPD [33, 36, 37], multinomial logistic regression has only being used for meta-analysis of genetic association studies under the retrospective likelihood [12, 80]. Most importantly, Poisson regression models have been used in entirely different contexts, such as survival analysis  and meta-analysis of follow-up studies with varying duration . Thus, an important advancement of this work is the extension of the commonly used approach for analyzing haplotype data [43, 44] in the meta-analysis setting, describing appropriately specified models and presenting them in a unified framework (i.e. the contingency table analysis). The empirical evaluation of the published literature suggests that studies reporting meta-analysis of haplotypes did not systematically differ from the meta-analyses of genetic association using SNPs in terms of the average sample size, but contain approximately half of the included studies and produce significant results twice more often. The meta-analyses that reported the complete data did not significantly differ from the remaining studies in terms of the included studies, the number of SNPs included in the haplotypes, the proportion of significant findings or the proportion of collaborative analyses. There was however, moderate evidence that the total sample size included in the meta-analyses that reported complete data, was smaller compared to the meta-analyses that did not. The application of the methods proposed in this work in studies that reported the complete data, made clear that approximately half of the significant findings are attributable to the method of analysis used by the primary authors and suffer from an inflated type I error rate. Indeed, for the four out of the nine studies that reported significant results, these were clearly refuted by the multivariate methodology. Three of these studies used the 1 vs. other approach, which although more powerful, is known to suffer from increased type I error rate , whereas the results of the fourth study were based on a misspecified log-linear model. Two additional studies produced marginally insignificant results (i.e. the multivariate Wald test contradicted the univariate one), mainly due to the existence of rare haplotypes or heterogeneity that has not been accounted for in the initial analysis. All the models presented here assume that the haplotypes are directly observed. However, as we have already discussed, the haplotypes are usually inferred and thus, treating them as known quantities may be problematic . The general framework presented in this work can be easily extended in order to account for this uncertainty, simply by weighting the inferred haplotypes by their probability [49, 50]. However, this will probably be problematic in many real life applications, except when dealing with a collaborative analysis, since a meta-analyst will rarely have access to individual genotype data in order to use them to estimate the haplotypes and their posterior probabilities. If combined genotypes are available for all studies, the meta-analyst may try to re-construct the haplotypes with a method of his/her choice and perform the analysis using the posterior probabilities as weights. Moreover, if individual genotype data is available (from the literature or in a collaborative setting), the framework can be extended to allow the haplotype risk to follow models of inheritance other than the multiplicative one (i.e. estimating the risk of haplogenotypes), or to include patient-level covariates. The methods proposed in this work, clearly outperform the traditional naïve method of meta-analysis of haplotypes, which simply consists of contrasting each haplotype against the remaining ones. This is expected to be more profound, especially as the number of possible haplotypes increases, increasing also the type I error rate due to multiple comparisons [59, 60]. Collapsing the haplotypes and performing a univariate analysis, may potentially be more powerful in several situations . However, in genetic association studies, even though we are interested in small genetic effects we are also concerned about the probability of false findings [106, 107]. Thus, the multivariate methodology seems to be a reliable alternative. We presented multivariate methods that use summary-based data as well as methods that use binary and count data in a generalized linear mixed model framework (logistic regression, multinomial regression and Poisson regression). The methods presented here are easily implemented using standard software such as Stata, R or SAS making them easy to be applied even by non- experts. In the Additional file 1, Stata code for fitting the models described in this work is given and we expect that these methods will be widely used in the future. The author would like to thank the two anonymous reviewers for their valuable comments that improved the quality of the manuscript. PGB conceived the study, performed the analyses and wrote the manuscript.